This CD celebrates the 100th CD release of Staalplaat. Front cover photo: "Babble": a disembodied art gallery installation. By all means, this was supposed to be one-trick pony. 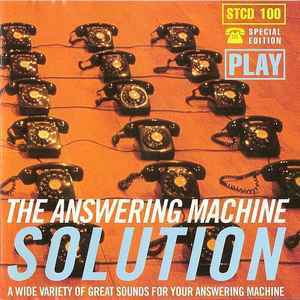 This is a collection of messages for answering machine by the likes of Bad Sector, Deutsch Nepal, Kingdom Scum, Brunnen, Left Hand Right Hand, Brume, Crawl Unit and many others. But somehow creators of this compilation were able to destroy limitation of concept compilations dealing with extremely short tracks (you know - 60 seconds of this, 30 this secons of this - with rare exceptions its not extremely interesting). A lot of those tracks are unbelievably funny and retain comic value for quite a long time. There's a variety of tracks ranging from insane preacher conversations with his dog and listeners (A Small Good Thing) to song by answering machine (Brunnen) to subconcious conversations (Kingdom Scum). Certainly there are few tracks that don't fit into the subject or simply waste space on CD (in particular, Nigel Ayers track - the longest one on this comp). But overall this is very enjoyable one-of-a-kind release, which might not be suitable for constant listening, but might improve overall mood of the listener.